A tide of cavalry, clad in royal blue armour, ploughs into a swarm of rats. The unfortunate creatures are thrown skyward in waves, as if by the prow of a ship. The Dragon Princes continue through the Skaven, their momentum scarcely slowed, tossing furry rat men like a toddler having a tantrum at a toy collection. 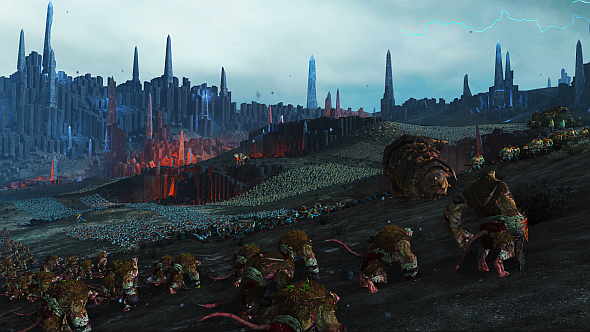 One by one, Skaven unit icons flash white, and the cowards do what they do best and flee. Across the battlefield, a colossal blue dragon lazily drops its mass upon a ramshackle warp-lightning cannon. It fills my screen when I zoom in. Who else might be coming? We speculate about Total War: Warhammer 2’s possible DLC races in our faction guide. Anecdotes like this are what the Laboratory – a new battle mode coming very soon to Total War: Warhammer II – is for. If you missed the news, the Laboratory will let you set up a custom battle in which you tune 16 different parameters to your liking. The scenario above, for example, came about after I reduced the gravity while raising damage, charge impact, and charge bonus duration. The Laboratory does come with a big disclaimer, however: your PC’s performance will suffer if you crank everything up to ten. Certain parameters are more demanding than others, most notably unit size. Wary of this, I only turned it up a couple of notches during a recent preview day in London, but this was enough to multiply a unit of Dragon Princes from 60 to 180. Two such units ploughing into a swarm of rats (too many to count) is still a pretty impressive sight. However, “if you’ve got 40 units in an army, and you’re multiplying the number of individual entities that are all being computed at the same time by ten, then your PC is probably going to run into problems,” communications manager Al Bickham tells me. To get a ballpark idea of what you are able to demand from your machine, I ask for some technical details. “Our internal benchmark tests were done with a Coffee Lake i7, with 32GB of RAM, and a GTX 1080,” Andersson explains. “That ran a ten-times unit size battle at around 30 frames-per-second, on average.” That’s quite playable, but it was with only one 20-stack army on each side. Custom battles obviously allow four armies per team, so no matter how powerful you thinkyour machine is, the Laboratory can probably exceed its capabilities. That clattering you can hear is the sound of competitive PC builders throwing gauntlets at each other. Or perhaps it is our hardware editor, Dave, salivating at the thought of a new benchmarking tool (I am aware dribble does not make a clattering sound – let’s say he has a metal bowl at his desk rather than admit I’ve stretched this metaphor too far). It is helpful for CA, too, in that it “gives us an idea of what sort of hardware would be demanded by something like this, and what steps we can take to mitigate that,” Bickham says. Andersson adds that they were able to identify bottlenecks in their code “when it comes to amping unit size up to ten,” and iron them out. Intel, their development partners on the project, have been doing plenty of their own testing, too. I may be reading a bit much into it, but it sounds like CA may be planning to take what they have learned beyond the Laboratory at some point. 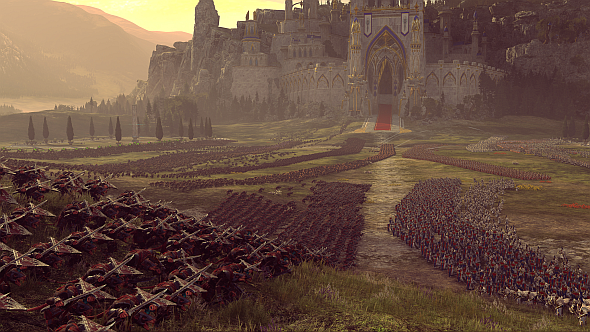 “In a way it’s a glimpse of what the future could be like in Total War,” Bickham says, “if we were to go down the route of having massively bigger unit sizes, and control things on a more realistic army scale. 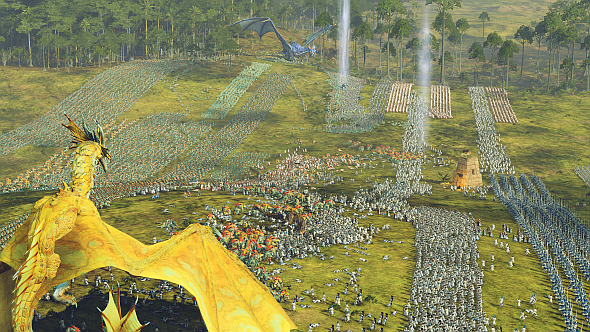 It’s an environment where people can play with that.” Total War games are known to build upon their predecessors’ codebase, so perhaps we can expect the next one to make use of what CA have learned here to deliver bigger battles as a matter of course. But, for now, CA expect you to do what you should in a laboratory, and experiment. It is a chance to embrace and enhance what you enjoy most about Total War: Warhammer II’s bombastic battles, and no doubt everyone will find their own preferences. “Mine is just big monsters,” Bickham says. “Crank up the impact and crank down the gravity, then pit two or three giant Carnosaurs or Hell Pit Abominations against lots of trash infantry, and just make it rain. “Bodies,” he adds, for clarity. When I mention the charge of the Dragon Princes and my unrepentant Bretonnian citizenship, Andersson says, “well, now you can get a lance [the cavalry formation used by the Lady’s faithful] with like 600 knights.” So now I know what I’ll be doing when the Laboratory launches. If you are not interested in flying rats and fountains of blood, however, you can make more grown-up modifications in the Laboratory. I can imagine friendship groups devising a set of house rules for their next weekend LAN party, or aspiring generals squeezing every drop of tactical challenge out of the game. Perhaps you think battles are over too quickly? Raise unit size and leadership, but drop damage and vigour costs: units are now bigger, tougher, and harder to rout, but they will not tire as quickly. Perhaps you think ranged units are a little weak in the meta? Raise their ammunition and reload speed – perhaps even their projectile penetration. Want more mileage from your magic? Reduce character ability cooldowns while raising their radius, along with the Winds of Magic reserve, for more potent mages. “We’re just looking forward to seeing what people do with it, really,” Bickham says. 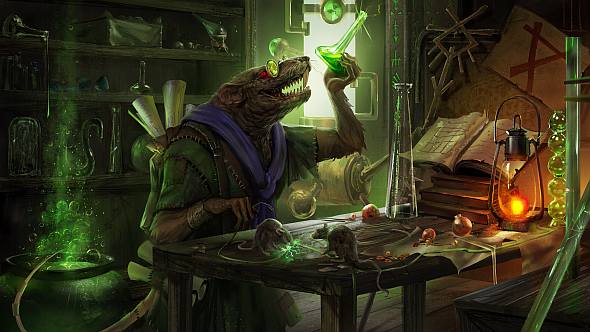 The Laboratory will be added to Total War: Warhammer II via a free update on Wednesday, December 14. It will be compatible with all previous DLC, including armies from Total War: Warhammer.